Can we talk? The Joan Rivers catchphrase is especially poignant for one figure in the paranormal community in the days following the comedian's death. Robert Murch is the foremost expert on Ouija Boards, and serves as a consultant on multiple film projects concerning the use of the (in)famous talking boards -- including the upcoming movie based on the Hasbro product. For more than 20 years, Murch has researched the history of Ouija and collected thousands of the boards. He has also exhaustively documented its use in popular culture, and chronicled how it has gone from alleged spirit communication device to its current reputation of portal for dark forces. Which brings us to Joan Rivers, who had a hell of a sharp wit even if she wasn't a force from hell. Rivers used a glow-in-the-dark Ouija board in the second season of her WE tv series Joan & Melissa: Joan Knows Best? In the February 2012 episode ("Joan Pulls A Beaver"), the two consult the board, and a psychic, about Melissa's love life. The board's appearance on Rivers' reality television show was just another chapter in Ouija history and piqued Murch's curiosity. 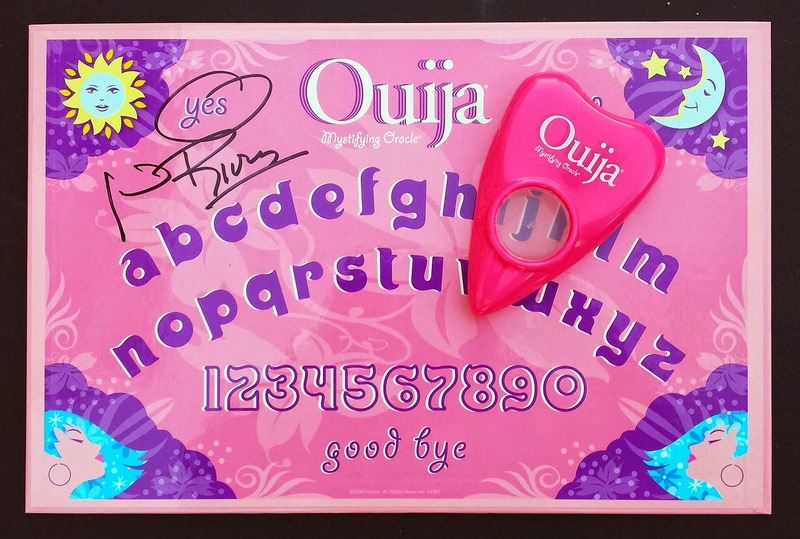 So before attending her live show in Boston in 2013, Murch tweeted to Rivers asking if she'd sign one of his pink Ouija boards. Her management got back to him swiftly to arrange it. After some scheduling issues, Murch finally met with the comedian who apologized they hadn't connected earlier. According to the historian, when Rivers took the board, she looked delighted and said, "Can we talk?" with a laugh. "She then quickly added, 'Well I hope we won't be talking on this anytime soon,'" said Murch. He said she also invited him out to lunch during her next stop in Boston. "Everyone knows Joan Rivers as a comic genius and a legend," he said. "It's all true but to me she was just a super cool and humble woman who took the time to meet with me last year and sign my pink Ouija after one of her shows." When asked whether Murch -- who is actually a skeptic when it comes to the Ouija's supposed paranormal connection -- would ever reach out to Rivers on the board, he said, "If I was going to contact anyone on the other side it would be Joan Rivers." Murch jokes that in the same episode they used the Ouija, Rivers recorded her voice for a GPS device and placed it in Melissa's car. "She said, 'How fabulous; long after I'm dead I'm going to be there telling you exactly what to do' to Melissa," commented Murch. "That doesn't sound so bad since, as the straightest gay guy that's ever lived, I could certainly use her fashion advice!" Very interesting. Robert murch is awesome.